Sad to hear this morning’s news about Tony Benn. He’d been quite frail when I saw him speak last year at the unveiling of a plaque to Thomas Rainsborough, and I’d recently heard he had been taken to hospital. So I wondered about him when Bob Crow’s sudden death was announced earlier this week, thinking that two of the great left wing figures might pass in a single week. But what coupled them in my mind wasn’t their political position but that both always put forward their views with a cleverness and charm that won them admiration and affection from those who disagreed and opposed them. From the other side I’d put Boris and Nigel Farage in the same group, but others like Thatcher or Scargill may gain the love of their supporters or followers but only earn grudging respect, if that, from their opponents. Benn always seemed a cut above the rest. I heard him speak a few times, and met him twice, the first time back in the early 1980s when he was in his pomp and by a long way one the most inspiring orator I’ve ever heard. You didn’t have to agree with him, and I didn’t always, but his clever deployment of his ideas was wonderful and carried you in his slipstream. 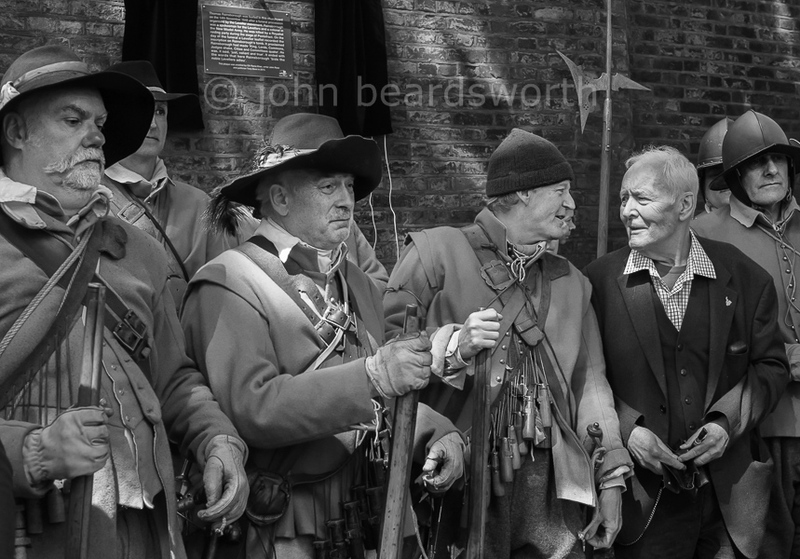 He looked frail when I met him last year, yet there was still the same old fiery glint in his eye as he wound up his speech and thanked the Sealed Knot for their role in the commemoration of Thomas Rainsborough. In the 1640s the radical Civil War leader had advocated one man one vote, and I wish I’d recorded what Benn said, but it was along the lines of… you know [pause for effect], if those in power thought voting would change anything they wouldn’t have given you the vote, and we’ve always had to be ready to fight. I think he was talking about the 1640s, but it sounded like a call to take up arms in 2013 and made me laugh, and I subsequently sent him a copy of this photo. Ultimately though, I’ve long thought that Benn lost his way or rather chose the wilderness, so last Christmas I gave my nephew a copy of Benn’s memoirs and wrote in it something suitably Blairite about the price of holding tightly to principles being that you never gain the power to implement them. But that’s too sour a conclusion on one of the most engaging figures of our times.